Unlike many artist’s I’ve interviewed Allan Storer can see no difficulty where artistic integrity may be compromised with the gap between art and commerce. A painter in St Ives and London UK he has created his own unique style. He rocks! What inspires him? GREGG: Hey Al, Your work is imaginative and intriguing. Your style is so distinctive. It appears to be a variation on either colour or theme. What’s going on from your point of view? AL: I feel the painting has begun to take on its own identity instead of the identity of the creator. I find it a bit fascinating. As far as what is going on from my point of view, that is a big question. At the very minimum, I would say almost all of my work is an exploration of the senses, feeling and so on. As to style or colour, I think that this is just a product of how I work and my intentions. I tend to work fast, I don't really want to be bothered with the mechanics of blending and shading and all that business. I have never been interested in being a painter of recognizable objects. It isn't who I am or why I do this. GREGG: It still seems to me that your work is a clever way to explore the senses. It feels like there is an empathy with recognisable emotions we all feel. It's like you've created this alternate world that might mirror our own. AL: When I'm fully into a painting, the rest of the world could be asleep and it does seem like an alternate world. I do think you are correct on a certain level and am beginning to feel abstraction is more where I am coming from . As much as some of us like to think we are what we appear to others on the outside, I can't help but think this couldn't be farther from the truth. I have never once looked in a mirror and thought to myself, "that is exactly how I feel on the inside" or "these clothes and hair style represent who I am." I suppose that it is one of the main reasons I have never been interested in painting portraits or trying to capture nature or looking like everyone else. Maybe this is the alternate world you speak of - the world that resides under our skin, so to speak. GREGG: Do your paintings have narratives or themes? When you're painting, is there a storyline in your head? Is there a message? AL: My goal is to leave space for each person to absorb it in a way that is personal to them. As far as themes, I would say all my paintings are equal parts energy, melancholy, introspection, seeing, listening, speaking and feeling. I tend to shy away from an overt message in artwork. I am not out to lecture or shock anyone. There are plenty of artists who already do that, or you can pick up a newspaper or turn on the TV and get some of that pretty easily. Anyway, that just isn't my aim. That doesn't mean that there isn't a message, it just means that the message is subtle and is probably going to be a little different for each of us. GREGG: How do you reconcile art as business? Is there a contradiction for you? AL: Well, first, I think "the business side" of art can be a tough hurdle for many artists to get over. I know that I personally struggled with it for many years. I still do sometimes. I knew that I had to first learn to separate the process of creating my artwork with the process of selling my artwork. The clearer that you make this line, the easier it is. So, when I am in the studio working I am only wearing the artist hat and when think of the business side, well the bills have to be paid and I put on the business hat. In this context professionals such as art consultants all play their part and are a positive influence between myself and the purchaser. The whole business side is just as much an art form as the painting. I meet artists all the time who don't like to think about the business side and it somehow has no place with their art but when someone really likes a painting and wants to hang it on their wall, I believe it is a great privilege and I have at least done something right. The idea that the artist lives some sort of impoverished life in a garret is an antiquated idea, even if it were ever true! Artists like Van Gogh and Gauguin suffered for their art, even Rembrandt died in poverty, but the art world has been one of highly successful and wealthy individuals, who if not rich may not have painted at all. The Pre Raphaelites were certainly a privileged group of artists. I find happiness and integrity in being self-sufficient and empowered by working every day for my own artistic future. As far as how I got here, I have always had an artistic and creative temperament in everything from my personal to working life and on and on. My earliest ambition and career route was to be farming. I loved the countryside, animals and nature too. As a youngster I spent every waking hour on a farm. I then developed a fascination for the coast and the sea; all things to do with nature and the elements, the poetry of Dylan Thomas. Incidentally Dylan Thomas was my indirect route to art, poets such as T. S. Elliot and the whole 20th. Century thing. The innovative ideas of Freud, Jung and the Surrealists. I then became more academic and reflective; went off to university, and it just evolved over the years into what I do today. GREGG: What do you think about the art world and art market? The super- wealthy really only support blue chip art and famous, dead artists while most living artists are struggling. AL: If you are you talking about wealthy big business conglomerates and individuals buying blue chip art of famous, dead artists then I think it is quite ambiguous. Obviously there is an investment issue here and they would like to have a return. Buying a Picasso will make a decent return one day, but the value of art is not quantified in the numbers found on a price tag. I prefer the art world of ordinary people in the community. I have connected with many people over the years, from all over the world who have art as the common denominator, a lifestyle if you like. This is something super wealthy people buying dead artists may never have the pleasure of experiencing, unless they get their brushes out, because their idea of an "art world" is a different one. GREGG: Great stuff! You do live and work in London, Cornwall and Wales. Why so? AL: Samuel Johnson said, "When you are tired of London, you are tired of life “and I feel the same. London is an energetic stimulating environment and I can drop in and out whenever. As well as our fantastic art galleries, museums and theatres. There is just not enough time to fully appreciate the experience. Incidentally my mother is from London too, so I am half at home here. Cornwall and particularly S. Ives is something else. Its fantastic light is ideal for the painter and the surf too is another attraction. I've spent most of my life in Cornwall too. In the early days painting and selling on various harbour fronts, which I still do ein plein air, although I now exhibit in a gallery there. GREGG: Yes I've heard you like to take your board out now and then! More than the palette? AL: I love surfing and have done for years, it has provided an invaluable grounding and really sources my rock and sea paintings in St. Ives. After a day spent in the water I still have to paint I have a feeling of energy and wave motion, crashing on the shore, I love it. My brother and nephew can really call themselves dedicated surfers. My nephew a bit of a "top notch" having surfed in several "countries in the world. That is also an attraction in South Wales too, where I have a small studio, although I admit the real call here is the "rugby" and its comraderies, again movement and energy, which initiated my pre disposal to painting rugby players as a genre. Again easily placed under the spell, I have many happy memories of the Arms Park and the hostelries of St. Mary' Street and the welsh "hoyle. GREGG: You are correct there is great energy in most of your work, even the tranquil ones have a subtle energy, how is that? AL: I paint very energetically, energy is important to me and my work. The most tranquil of paintings area paradox because I literally sweat when painting with either a palette knife or brush not to mention my heavy squeegee. There is energy under the calm so to speak. Rather like a Swan paddling hard under the surface. I think it is important to "train up" in the gym at least three times a week. GREGG: Good for you. Do you come from an artistic family? When did you first become aware of yourself as an artist? My mother is the artist, my father the pragmatic engineer, from a long line of builders. Having said that though, he was creative and investigative in a mechanical way. Highly inventive in fact with an eye for machine design. My mother influenced me a lot when I was a child with her own figurative drawings and so on. She won a scholarship to Art College before the war but joined the war effort as a WRAF instead. 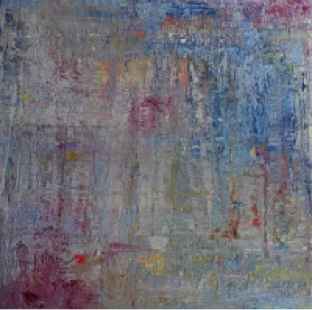 She has always regretted that decision and even now remains a frustrated artist painting daily and approaching ninety. AL: I was about 14 when I realised that I too could be active in the process of art, due to a family move and a future in farming definitely no longer an option. Two school teachers a Miss Hutchinson and Connie Bevan took an interest in me. I remember it was the first time I had been asked to pin my art work, it was a medieval market scene I remember, and written English composition on the class room wall. Suddenly I had become both an artist and writer of stories. I kind of “woke up" to another me and those two teachers, Connie Bevan, particularly showed me the way. GREGG: I’m sure many people are too. Thanks Al. It has been great.